We are compiling some articles based around the setting up and maintenance of an online store. They are all quite general in nature so can be applied to any type of shopping cart software, not just our own Ecommerce Templates. We haven't enabled commenting in a blog style but we do very much welcome feedback so if you have any questions at all, please contact us. If you already have a fair idea of what products or services you want to sell, you'll need to think carefully about how you are going to get those online and which platform / business model / payment set up to employ. We are going to discuss some of the alternatives here, from setting up your own online store to drop shipping and selling on third party platforms. 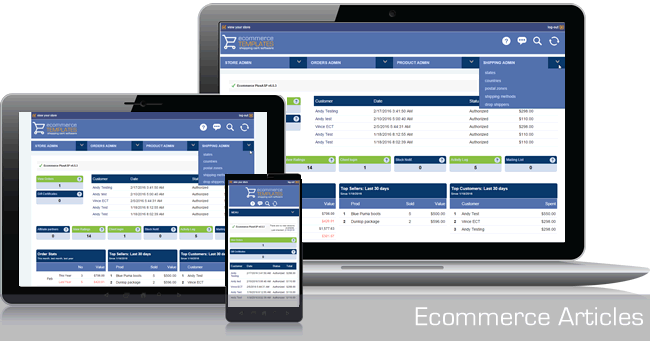 In this article we are going to cover the main differences and features of licensed shopping cart software and a hosted shopping cart solution. We will start with a general definition of each and then move on to possible scenarios where you may want to choose one over another. Setting up an online store isn't that difficult really and when the first few sales have come in it's then easy to sit back, put your feet up and refresh the orders page. What we're going to discuss here is how you should treat your store like any other business, staying ahead of the curve, continually adding, tweaking and testing new content and ideas. In this article we are going to look at how to write great product descriptions. We will also look at layout preferences and how to attract visitors from the search engines then turn them into (repeat) buyers.